So when I last blogged I had described my amplifier history up through the Kustom top and Bandmaster bottom. I was driving a 1969 Volkswagen Beetle during that time and the only way to lug the Bandmaster was to remove the passenger seat. The Bandmaster cabinet was the larger one built in the early 1970's. It was way too bulky and heavy. During the 1950's through the 1970's no one seemed to come across the idea of miking the amplifier. We all thought bigger and more powerful was better. All the rockers had stacks of Fender Dual Showman and then moved to Marshalls. I salute the genius that decided to put a microphone in front of a Fender Champ amp and run it through the public address system. So I traded the Kustom amplifier and the Bandmaster cabinet at a music store for a brand-new Yamaha amp. It’s a G50-112. The guy at the store saw me coming with these two vintage pieces and probably bought the amplifier at a deep discounted price. He was a Yamaha distributor. I'm sure he made out like a bandit. But I didn't want that big old speaker cabinet any longer. So I was happy with the deal. 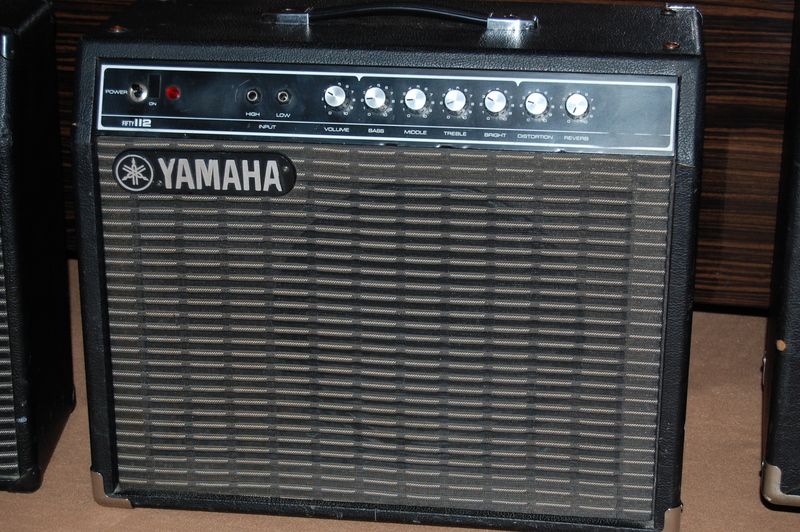 The Yamaha is a solid state amplifier that is good at playing clean. Blues players would hate it. Shredders would hate it. However, clean is what I like, since my playing style is finger picking. Instead of having a master volume and a volume control, this amp has a volume control and a distortion control. The distortion functions like a fuzz tone. I do not use that feature. The amp was designed and manufactured in Japan and was even signed by one of the amp technicians on a sticker inside the cabinet. G50-112 denotes that it is a 50-watt amp with one 12" Yamaha Special Design speaker. It probably weighs around 50 lbs. This is my favorite amp. Since I’m older, I started looking for something lighter to carry around to play music through. A few years ago, I purchased a Pignose G40V. This is a class AB tube amp. It is powered by two 6L6GC tubes and originally had three 12AX7 for the preamp and phase splitter. I changed one of the preamp tubes to a 12AK7 to get a cleaner and quieter sound. The Piggy was designed for rock and roll and over driven tube distortion. Turn up the volume and you can clear a room. I keep mine quiet and it sounds great. You can just plug into this amp and go. There are no effects, just amplification. It's 40 watts into a 10" speaker that can handle 80 watts. It has more bottom when I plug it into a one 12" speaker cabinet. I’ve also got 2 Squier 15 watt amplifiers that I use to power my keyboard set up. I have put a switch in both of them to turn off the internal speaker and I run the signal into some larger speaker cabs. This is strictly for home use. I have two other amps. One is a 1970's Fender Vibrochamp. It needs a new rectifier tube. It looks like it’s been played at many bars. But it has a wonderful sound and the tremolo is incredible. The other amp is a Squier 25 Champ. It’s similar to a Fender Champion model that was being sold at the time. These are solid state amplifiers.